This is a question that I seem to ask myself quite often. Some of my favorites never make it to these pages because they seem too simple, somehow. Like this homely eggplant potato bhaaji (subzi, a combination of a braise and stir-fry) that I made last night. But these are the recipes I keep returning to, that I have made so often that I can cook them on auto-pilot, and for that alone, they are definitely blog-worthy. This recipe is almost stereotypical in its use of ingredients favored by Maharashtrian home cooks. A textbook example of the Maharashtrian way to cook vegetables. It has the typical phodni (tempering) trio of halad, hing, mohri, that is, turmeric, asafetida and mustard seeds. It uses flavorful (but not hot) dhane-jeere pud (coriander cumin powder). Simply mix cumin and coriander seeds in equal quantity, toast very gently, just enough to wake up the spices, and grind to a fine powder. I make this powder in half cup batches and am always amazed at how I run through it in a matter of days. It uses goda masala, which has a smoky, savory flavor that is hard to describe in English but has a Marathi word- khamang. I stock up on this black gold on trips to Maharashtra. You can find it in some US stores, or make your own. Jaggery or gool lends a complex sweetness and a glossy finish to the sauce clinging to the vegetables. This is the stuff that elevates the everyday bhaaji to a lick-your-fingers classic. Peanut powder or danyacha koot makes a thick and nutty sauce. I roast peanuts, skin them and powder them coarsely, you want to retain a bit of texture. I store a jar of roasted powdered peanuts in the fridge and use it in typical Maharashrian ways like bhaajis, koshimbir and for sabudana khichdi. You can use almost any combination of vegetables in place of the eggplant and potato. The salt draws out water from the vegetables that then cook in their own steam, which results in a concentrated flavor. But if you feel like the vegetables are sticking to the pan, feel free to add a few tablespoons of water to get the process going. 5. Add salt to taste and 2-3 tbsp. crushed jaggery. 6. Cover and cook the bhaaji for 20 minutes or until the vegetables are tender. Garnish with a large handful of minced fresh cilantro. Let it rest for at least 20 minutes before serving. We enjoyed this bhaaji with rotis and radish raita. It is also perfect with yogurt-rice and dal-rice. Dalu is a creature of routine. His day is a regimented line-up of naps, walks, treats and social visits with Tony, the newspaper guy on the corner, which result in more treats. Most dogs are so eager to please their humans; not this one. If I call out to him while he is basking in the sun, he looks slyly from the corner of his eye to see if I am offering him a treat or reaching for his leash, otherwise he quickly squeezes his eyes shut and pretends to be asleep. Don't call me unless you have something tangible to offer- that's Dale's motto. I know what you mean, some of my sipmles but most delicious food never turns up in my blog too. I have never added roasted peanut pwder, next time i am sure gonna do it. Nupur, this stir fry is definitely blog worth (in my opinion anything with potatoes and eggplants is). Is peanut powder traditional(forgive me for that word) or is it your addition? I like it all the same. I quite like Dale's motto. this bhaaji looks absolutely great n comforting! Ah my favorite. I also think sometimes about blogworthiness of a recipe. But I myself search for the most simple and flavorful recipes all the time. Then why not blog about it! Try Japanese eggplant instead of Italian it tastes better u feel. the dish is blog worthy...all food from all cuisines are. Vaangi-potato bhaji is my favorite too. Now that you say it, I realized that most of my day-to-day recipes are also not on the blog simply because they seem so simple. Goda Masala is so versatile! Use in in bhaji, amti, masale bhaat. I love the robust flavor. Dale is a Smart guy, err, dog! Such clarity of thought.LOTS of love to him. This is ekdum blogworthy! I think its the simple ethnic dishes from different parts of India that we don't get to taste. I mean you get dosas everywhere (in US) but not pongal which is an excellent and very common dish to us Tamilians. Nice presentation Nupur! It might be a simple dish but your style and presentation brought all the much needed attention to the dish. Now it is a celebrity dish! this is definitely blog-worthy and looks so good.Often simple and easy recipes come out so lip-smacking.And I love the way Dale is sun basking ,wish I can have that lazy "lamhe" in my life,here sun doesn't show up regularly,most of the time it's raining. Vaangi with batata is one of my favorites. Classic Maharashtrian! Btw it sounds like Dale is more like a cat in a dog's skin. wow! this is your everyday subzi? :D it's amazing! Of course it's worth blogging! I love the recipe! Wow..yes this subji is totally blog worthy! This combo always saves me when I am running all the veges from my fridge. This is must in my weekly menu plan. :) Mine is different method and sometimes i make it in pressure cook for faster version. Vangi batata bhaji is one of my fav bhajis. And at our house nobody liked it! So whenever my maushi who lived in our neighborhood made it, she would always send some over. I make it at my house now, but never turns out as good as hers. Your recipe inspired me to put this on dinner menu for tomorrow. I always love Dale stories! What with such a busy schedule full of naps, walks, visits, he sure needs plenty of R&R. Smart dog Dale boy! Love Vangi -Bata anytime! But I dunno why I tend to prepare the Bharla Vang more than this simple delicacy. Oh I love this bhaji and I make it very often too. Where do you get goda masala in the US? Hi Nupur, Vangi batatychi bhaji is a fav in our house too. Kharach , these are comfort food na :) I made "valacha bhirda" last weekend, and remembered you. Thought i should check out if you have posted a recipe for that. Happy Cook- Peanut powder adds a unique taste. Indosungod- Oh, the addition of peanut powder is very traditional. In my area of Maharashtra, almost every simple everyday subzi will get a sprinkle of peanut powder (it is kept ready and waiting in jars in most homes)- and it adds so much richness. If you like ridge gourd, it is divine when cooked in this style. Rachana Kothari- I know, we need to make more of an effort to share the simplest dishes because those are sometimes unique to a household. Mints!- I agree, I tend to cook the simple everyday dishes from other blogs. And yes, Japanese eggplant is sweeter and more luscious, but I don't find it as often and it is often quiet expensive. Italian eggplant is available year round to me. 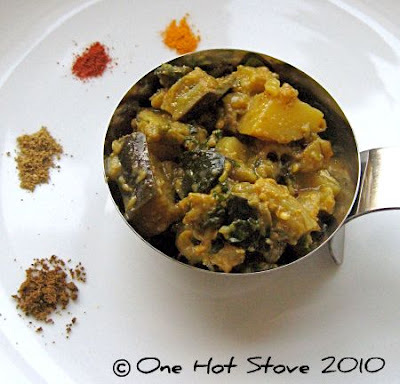 Yes, the flavors are the same as bharli vangi but much less labor intensive and can be made with any type of eggplant. PJ- Dale is the smartest, he knows how to maximize gain with minimum effort on his part! Sangeetha- I agree, the home-style recipes are the most treasured and actually, the bloggers are the ones making them accessible. I have learnt so many dishes from all parts of India only because other bloggers took the time to post those recipes. Swetha- Thank you :) But it is already a celebrity dish to everyone who loves Maharashtrian food. Jaya- Having Dale around is definitely a reminder to slow down and enjoy the simple things in life. He takes advantage of every ray of sun we get in the winter. maninas- Thank you- I am so glad you like it! Sonia- I'd love to see your method- is it the Gujarati style because I know this is a favorite combo in Gujarat too. Namita- I know, there are some cooks who have the whole "hatala chaav ahe" thing going on, and you can never make food to match theirs. Yes, Dale needs R&R from his R&R! arundati- I know, I am going to make more of an effort to post the everyday dishes, I made tons of them during the A-Z project and then not so much. I'm going to try this combo Andhra style next time, must find a recipe. Kanchan- Well, I do know why I don't make bharla vanga more often, because for me, finding good baby eggplants is really rare! I know that's not a problem for you living where you do. Smita- I don't know exactly where, but people have told me that it is available in some big stores. Nags- I agree, we should post it for friends from other regions if not for ourselves :) and yes, I keep finding new interesting ways to make rasam even after making it a hundred times. Arati- Yes, I have posted bhirde but a long time ago, so maybe it is time to go revamp that post. There are some words that are so difficult to explain. Like khamang. It is a word that I can feel but never explain! Some of the marathi dishes like kanda batatycha rassa or vangi batata are so easy to make and so delicious and certainly blog-worthy! Your vangi batata is reminds me of home. As always, I learn so much about the Indian spice pantry from your blog. Thank you! Mmmm...eggplant! Dale is so cute, I'm willing to bribe him with treats to be my pal. this is definitely blog-worthy. I like the way you have explained each component of the recipe. :) Eggplant & Potato is always a hit-pair. Dale is a very smart doggy. ;).. I think the simple classic dishes are the most blogworthy as those are invariably the ones that are cooked in every household but rarely make it to cookbooks! This looks yummy!! And Dale is a darrling! .Hullo Nupur, you have a very sweet blog and your pp event is so cute, i love this aubergine and we do make something very similiar yet different. . .
now that have said hi to you am going to take a stroll around your lovely blog and droll at ur eliciousness and am sure to find a recipe to participate in your sweet blogging event. .
do you cook the onions at all before adding the eggplant & potatoes? aquadaze- You are right, some words like khamang have to be experienced rather than described! I'll definitely come for the next one! Lavanya- Yes, they rarely make it to cookbooks but they make it to blogs, for which I am eternally grateful! Oh, I'm sorry about your pressure cooker incident, but yes, I hope you give it another try and overcome the trauma. Good luck with your goda masala experiments, let us know how it goes! rog peppe- I do cook them, actually, and edited the recipe to specify that. Yay for simple dishes! Aloo biagan and eggplant pomodero are my two favorite dishes when I get bored of baigan bharta. Another favorite comfort subji of mine is aloo gobi and several times I put a North Indian twist to it by adding panch phoran. Do you like that flavor? It gives it a nice twist compared to jeera or mustard. Hmm...why is that potato is the favourite to add with any kind of veggie in almost every part of India - bhindi aloo, baingan aloo, beans aloo - but it definitely makes the dish so much more tasty doesn't it?! Cooking Foodie- Yes, it would be perfect with parathas. Sharan- Yes, I love panch phoran but don't tend to use it as much as I could. I agree, it takes simple vegetables to a new level. Vaishali- LOL these dogs are so clever and funny, aren't they? I was like 11,but the taste still remains fresh in my memory! Unfortunately the lady who cooked it is no more :(. Since then am on a look out for vaange batata that I'd like. Any suggestions? Though I have never tried dhane jeere pud! I felt I *had* to make this yesterday, even without all the right ingredients (peanut butter for peanut powder - eek!). It was a thrillingly new taste experience. Now I feel I *must* order some dagad phool from Amazon (and buy some actual peanuts). Still my favorite Indian food blog.